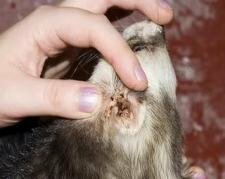 Ferret ear mites are the most common ear problem in fuzzies. Don’t freak out when you discover ferret ear mites, they’re pretty easy to treat and they don’t cause any serious damage to your fuzzy. For your fuzzies comfort you will want to treat them as quickly as possible though. Where Do These Ferret Ear Mites Come From? Does your fuzzy come into contact with other ferrets, dogs or cats? Then most likely, these tiny insects jumped hosts. Ear mites generally don’t survive very long outside of a host. Which means it’s extremely unlikely that you have transmitted them to your fuzzy yourself, the way you can transmit fleas for example. How Do I Know My Fuzzy Is Infected? When you give your fuzzbutt his weekly health check up, don’t skip looking into his ears. Normally, ferrets produce a reddish-brown earwax. If the wax is almost black, and there’s lots of it, ferret ear mites are most likely the cause. To be absolutely sure, you will need to have it checked out by a vet though. They will examine the ear wax under a microscope where they can actually see the tiny insects crawling around. Even though they seem to scratch themselves more than any other animal, fuzzies usually don’t scratch their ears when they’re infested. Instead, you might notice your ferret rubbing his head on the floor, couch, you, just to relieve some of the irritation. If your fuzzy is walking with his head slightly tilted to one side or he’s shaking his head a lot, this could also be a sign of ear problems. And last but not least, put your nose to work. Normally your fuzzbutt’s ears shouldn’t smell. How Do I Get Rid Of Ferret Ear Mites? After your vet has confirmed the problem is caused by mites and not an ear infection, it’s time to battle those little bugs. First thing you should know is that a mites life cycle, from egg to adult mite, takes about 3 weeks. The eggs are unaffected by an ear mite treatment. This means you’ll have to repeat the treatment once or twice every 7 to 10 days to make sure you kill all the newly hatched parasites. First you’ll need to get rid of the ear wax. Use a Q-tip, or better yet, a solution that dissolves the wax like baby oil, Oti-Clens or Marshall Ferret general ear drops. TIP: Make sure any fluids you use are body temperature (put them in your pocket for a couple of minutes before applying). Scruff your fuzzy and put 3-4 drops in each ear and massage it in. Hold your ferret’s head for a minute or so for the product to loosen the wax. Your fuzzy will shake his head as soon as he can, leaving you covered in ear wax. TIP: Don’t wear your best outfit and preferably treat your fuzzy in a room that’s easy to clean. Use a Q-tip to clean the remainder of the wax. Use the ear mite treatment your vet recommended (possibly Ivermectin). You can also use the flea treatment Revolution. If you use Revolution, use one kitten/puppy tube on the back of your ferret’s neck. Repeat that in 1 to 2 weeks. Wash all bedding frequently during the treatment. Don’t forget to treat any other pets you might have. Do not use ear mite products that contain containing betamethasone BP, neomycin BP and monosulifiram. Apparently there have been two reports where this kind of product resulted in ear damage and surgically removal of part of the ear.